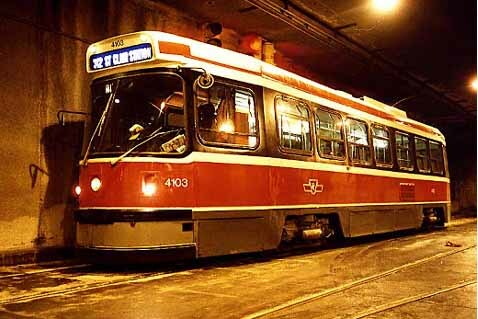 A small but historic part of Toronto's streetcar operations was replaced by buses in March, 2000. The changeover involved no removal of track or overhead, and was barely noticed by most TTC riders. Bromley, John F., and Jack May, Fifty Years of Progressive Transit (New York: Electric Railroaders' Association, 1973). Hood, J. William, The Toronto Civic Railways (Toronto: Upper Canada Railway Society, 1986). Pursley, Louis H., The Toronto Trolley Car Story: 1921-1961 (Los Angeles: Interurbans [Special 29], 1961). This subtraction from TTC's streetcar operations was the 312 St. Clair night car, which had operated between St. Clair Station and Gunn's Loop between 1:30 a.m. and 5:00 a.m., seven days a week. The day and night services overlapped slightly, with the last 512 car leaving Yonge at 2:12 a.m. Replacing the overnight cars with buses allowed TTC to extend the service from its western terminus at Gunn's Loop (St. Clair Avenue west of Keele Street) to Jane Station loop via St. Clair Avenue and Jane Street. TTC initiated the change as a means of providing a new overnight transit service for customers on St. Clair Avenue west of Gunn's Loop and on Jane Street between St. Clair Avenue and Bloor Street. The buses will continue to use the 312 St. Clair route designation. The St. Clair Avenue streetcar line was opened without fanfare by the Toronto Civic Railway on August 25, 1913. 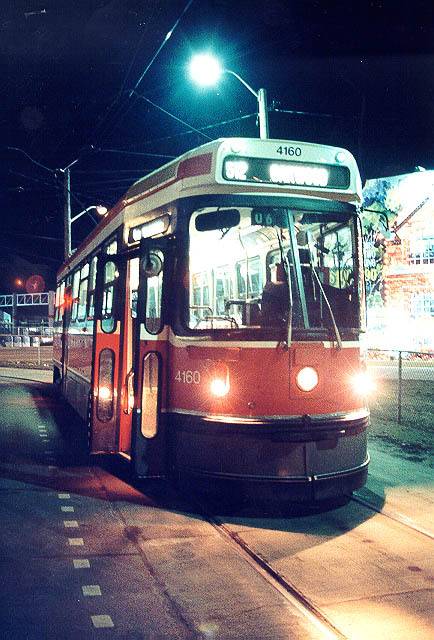 An early TCR night car schedule showed the line's last eastbound car departing Station Street (Caledonia Road) at 2:20 a.m. Twenty-five years later, under Toronto Transportation Commission management, St. Clair became a testing ground for the TTC's new PCC cars, and was the first line in the city to host the streamliners in regular service. On the evening of September 23, 1938, ceremonies were held to mark St. Clair's conversion to all-PCC operation, and the St. Clair night car became Toronto's first PCC-operated night car service on September 24. At that time, the St. Clair night car route ran from Lansdowne Loop (St. Clair and Lansdowne) to Simcoe Loop on Front Street via St. Clair Avenue, Yonge and Front Streets. This lengthy nocturnal routing was eliminated June 17, 1942, when the night cars were removed from Yonge Street, now following the route of the daytime St. Clair cars instead. The railfan community, if generally aware of the impending conversion of route 312 to night buses, seemed oddly silent on the issue in the weeks leading up to the change. After all, they could take comfort in the knowledge that 512 St. Clair cars would continue to operate daily until approximately 2:00 a.m., as noted above. The logic behind TTC's decision to subsititute buses for streetcars for a few overnight hours seemed reasonable, if lamentable, from the fans' standpoint. 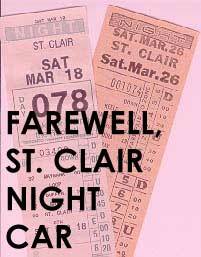 Thus it was that Route 312 streetcar service passed away in the early hours of Sunday, March 19, 2000 without ceremony or incident, rather like the opening of St. Clair service by the TCR way back in 1913. The late hours and chilly March temperatures probably deterred most fans from coming out for a final ride. Fellow enthusiast Rob Hutch rode and photographed the line on the night of March 17-18. I joined him in bidding the service farewell on March 19, when we rode CLRV 4160 back and forth for most of its route 312 trips. As far as I can tell, we didn't encounter any other fans en route. Among the evening's highlights was the sight of newly-minted destination signs in 4160 and some other cars. These new rolls (featuring night route exposures printed on black backgrounds instead of blue) are nevertheless equipped with exposures for Route 312--a tentative sign, perhaps, that all is not lost. Realizing how difficult it would have been to get back to St. Clair Avenue from Roncesvalles on a Sunday morning, we declined to attempt staying aboard the last car to the bitter end, stepping off around 4:30 a.m. Having finished saying our long farewells, we headed away with pictures and a few transfers as souvenirs. Credit Rob Hutch with this stunning photo of CLRV 4103 paused at the entrance track to the underground loop at St. Clair West subway station. With the subway closed, 4103 will run through the short tunnel without entering the loop. Take a good, long look at that blue rollsign exposure, yet another rare breed soon to be extinct.